SALT LAKE CITY (AP) James Harden and the Houston Rockets are defined by their explosive offense, and it got the best of the Utah Jazz on Thursday night. 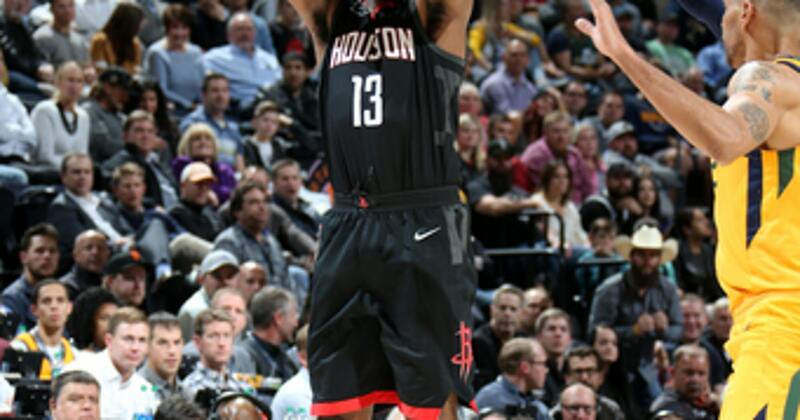 Harden scored 29 points, Ryan Anderson added 23 and Houston overwhelmed the Jazz during the third quarter in a 112-101 victory. The Rockets totaled seven 3-pointers in the third, which equaled the number of field goals for Utah in the same stretch. Harden and Anderson each shot 3 of 4 from the perimeter in the quarter. Chris Paul added 18 points, 13 assists and nine rebounds for the Rockets. Houston (19-4) won its eighth straight game and 14th in 15. The team is 9-0 with Paul in the lineup. Donovan Mitchell had 26 points, Alec Burks added 17 and Thabo Sefolosha chipped in 14 to lead the Jazz. Utah (13-13) dropped its second straight game. Utah played from behind throughout much of the first half after struggling with turnovers and erratic shooting. The Jazz turned it over eight times before halftime, leading to several key baskets for the Rockets. Houston surged in front after Gobert committed back-to-back turnovers less than two minutes into the first quarter. Utah rallied twice to take the lead, but both runs were answered with bigger ones from the Rockets. Houston used a 13-2 run early in the second half to pull away from the Jazz. Clint Capela got it going with a three-point play and finished it with a dunk to give the Rockets a 74-53 lead with 7:00 left in the third quarter. Houston led by 25 points after Ariza buried a 3-pointer in the opening minute of the fourth quarter. Rockets: Houston has totaled 41 3-pointers in two games against Utah this season. … The Rockets went 14 of 14 from the free-throw line over the final three quarters. … Harden has averaged 35.4 points in his last five games against the Jazz. Jazz: Utah has allowed at least 37 points in a quarter only four times this season. Three of those high-scoring quarters have come against Houston. … Gobert is averaging 5.0 points and 8.3 rebounds in 25.3 minutes per game since returning from a knee contusion. Rodney Hood has been sidelined for six games because of ankle soreness. Utah’s offense has not been the same without him. Hood was averaging 17.7 points per game and emerged as a reliable sixth man. Jazz coach Quin Snyder said there’s no timetable for Hood’s return. ”We miss him in lots of ways, especially his ability to take us through periods of the game where we have a dry spell and he’s able to score,” Snyder said. Jazz play at Milwaukee on Saturday. It is the start of a six-game, 12-day trip. Rockets play at Portland on Saturday, concluding a three-game trip.